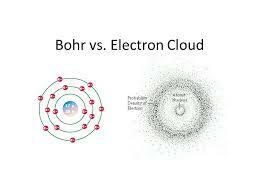 Electron cloud model was given by Erwin Schrödinger and Werner Heisenberg in 1925. Through this model, they tried to explain the probable positioning of an atom. According to this model, electrons can be found at certain places in clouds near the neutrons. As you know, atoms are the smallest constituent of matter that is present in the universe. The general structure of an atom consists of a positively charged neutron surrounded by the negatively charged electrons. Since the negative charge of electrons and the positive charge of the protons are opposite but equal, they balance out each other and the net result is that an atom remains neutral. But in some cases, it may happen that during chemical reactions, an atom may lose or gain an electron. If it loses an electron, it becomes negatively charged and is known as an anion. If it gains an electron, it becomes positively charged an is known as a cation. Examples of anions and cations are sodium and chlorine atoms respectively. According to the Bohr’s calculation for a hydrogen atom, the electron under normal conditions always stays at a distance of 0.529Å from the nucleus. 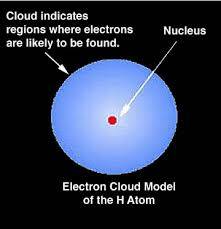 But according to the cloud model, the electron keeps on moving away or towards the nucleus and the maximum probability of locating it lies at a distance of 0.529Å from the nucleus. So, to conclude, the radius of electron cloud or radius of maximum probability is 0.529Å.